Gerald of Wales described Geoffrey as a “deceiver and a dissembler.” Roger of Howden described him as a “son of perdition”. However, given that none of Henry II’s legitimate surviving sons could be described as loyal to their father it is perhaps not surprising that Geoffrey as son number three should have been untrustworthy. He joined the Young King and Prince Richard in their rebellion against their father in 1173. Nor is it surprising that Henry II used Geoffrey as a political pawn in his empire building strategies. Henry had supported the subjects of Conan IV of Brittany when they rebelled against him. Finally Henry was victorious, peace required that Conan was forced to abdicate and his daughter Constance was betrothed to Geoffrey – Geoffrey taking on the title Duke of Brittany (in 1166) which Henry ruled personally, in theory, until Geoffrey came of age. Geoffrey was required to give homage to the French king, just as Richard was required to give homage for Aquitaine. It was a neat device that allowed Henry to continue to build his empire without public recognition that Henry was the French king’s vassal. Part of the problem between father and son in later years was Henry’s inability to relinquish power from his own hands. In response to the rebellion of 1173 Henry did concede that Geoffrey should marry Constance and have half of the revenues of the duchy, along with the task of quelling the rebellion that he had stirred in Brittany. In November 1179 Geoffrey was in Paris to witness the coronation of King Philip. Geoffrey and Constance married in 1181. By 1184 unrest stirred again. 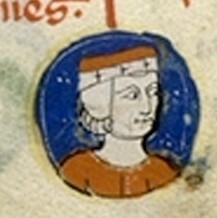 The Young King’s death during his rebellion against Henry in 1183 elevated Richard to the role of Henry’s heir. Henry envisioned a land redistribution with Richard’s duchy of Aquitaine being handed to Prince John. Richard having been raised in Eleanor’s court and having subdued the region by force was not prepared to hand his territory over so easily. In the end Richard was obliged to hand the duchy back to his mother who was removed from prison in England and bought to France for the occasion. In effect this meant that once again Aquitaine was in Henry’s hands. Geoffrey and Richard remained at loggerheads about land and position as Henry did not establish any of his sons as heir apparent. Geoffrey, perhaps recognising the importance of strong allies, became friends with the French King Philip Augustus (Louis VII’s son). Philip made him a senschal of France. He died on the 19th August in Paris as the result of an accident that occurred during a tournament. Chroniclers record that Philip was so distressed that he attempted to climb into Geoffrey’s grave. Geoffrey’s son, Arthur, was born the following year in 1187. He also left two young daughters; Eleanor, who was born in 1184 and Matilda, born 1184. Matilda died before she reached her fifth birthday while Eleanor and young Arthur faced uncertain futures in the hands of their Uncle John. This entry was posted in The Plantagenets, Twelfth Century and tagged Arthur of Brittany, Brittany, Eleanor of Brittany, Geoffrey of Brittany, Philip Augustus, rebellion by JuliaH. Bookmark the permalink. I am new to this site and enjoy it tremendously. I am fascinated by history as is my husband and this site is so informative and adds depth to info we have previously read. Thank you!! Hi, I’m glad you are enjoying it. There’re lots of great history blogs out there. An earlier Duke Geoffrey of Brittany (died 1008) was an ancestor of Duke Conan IV and thus of Arthur and his sister Eleanor (called the Fair Maid of Brittany). Constance was called Konstanza Penture in Breton; her mother was Margaret of Huntingdon (cue the Robin Hood legend), and through her father Constance was the Lady of Richmond. As her second husband, Constance was made to marry Ranulph de Blondeville, Earl of Chester, but there was no love in that match (Richmond and Chester had despised each other certainly since the Anarchy and probably since the first years of the Norman Conquest, so much so that the feud later blew up again in another form as the War of the Roses). So there was no issue from this marriage. Constance divorced Ranulph and married Guy of Thouars, a member of an a noble Occitan family that had been allied with hers since time immemorial (and they famously served together at Hastings). They had a daughter named Alix. King Richard had made Arthur (aged three) his heir in 1190, but at some point he’s supposed to have appointed Prince John instead – at least that’s what John claimed on Richard’s death. When John was made King, his mother Eleanor of Aquitaine’s home province Poitou rebelled and she was besieged by her own people in her castle of Mirebeau. Eleanor the Fair persuaded Arthur to go to Mirebeau to plead with their grandmother to support them. John, in a panic, rushed his army there and captured the two youngsters. Arthur was imprisoned in Rouen, then mysteriously disappeared. The gaoler’s wife accused John of killing Arthur, and John responded by starving her and her family to death. When word got out, every one of John’s continental territories rebelled and went over to the French: all of Henry II’s efforts in building the mighty Angevin Empire were brought to naught by John’s perfidy. In Shakespeare’s “King John”, one clearly sees sympathy for a mourning Constance, who in reality died in 1201, two years earlier than her tragic son Arthur. Alix became Duchess of Brittany, and King John faced increasing dissent in his only remaining territory, England. In 1215, even his own advisers required him to sign the Magna Carta. He subsequently repudiated this charter, but died soon after. John’s son King Henry III kept Eleanor a prisoner. In a display of circular reasoning, he also changed the law to exclude her from the throne. When she died on 10 August 1241, the Annales Londonienses declared her the rightful heir to England. It might therefore be argued that all of the Plantagenet kings after Richard I were usurpers and that the rightful sovereigns of England were the ancient family of the Dukes of Brittany. The spirit of John’s opponents was embodied during Henry III’s reign in the courageous attempt by Simon de Montfort, Earl of Leicester, to establish a sovereign, elected parliamentary republic, a vision that would resonate down the ages. Very good background, Geoffrey, a much appreciated. Rather refreshing to read something about de Montfort that does not include the phrase “over-mighty subject”. There’s tons of stuff about Richard and John, but so little about Geoffrey. Nice to find a well-written piece. Glad to find you.